Keep your resources stocked up at all times with our BSI First Aid Kit Refill Small. This set has everything your business needs to deal with injuries and wounds in the workplace. Devised by the British Healthcare Trade Association, it is suitable for use as replenishment and boasts quantities designed to reflect the number of potential accidents likely to occur in a specific work place. Add to your existing stocks for back up or use to compile the perfect kit for you - this set fits easily into all environments from nurseries through to offices. 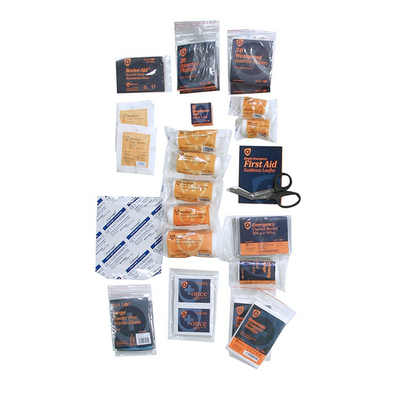 For those requiring complete sets or first aid kits for specific environments, we also stock a range of Travel and Burns First Aid Kits at exceptional wholesale prices.